I submitted this very short description of The Book Lady as part of the Spotlight on Bookstores series. Every Wednesday, this blog hosts a section encouraging people to write about their favorite independent bookstore. 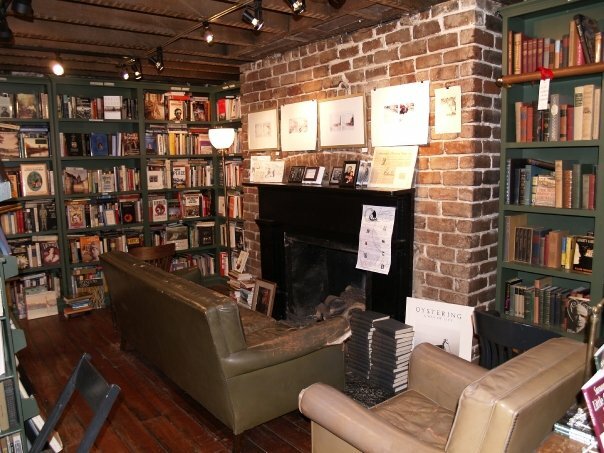 I love to frequent a little, independent, used bookstore called THE BOOK LADY, on Liberty Street in Savannah. It is nestled a couple of steps down from the street level, in the lower level of an historic old home in downtown Savannah. Brick walls, stuffed leather chairs, fireplaces and floor-to-ceiling shelves, filled with interesting titles. Her desk is always covered with stacks of invoices, orders, and other books she is considering. She handwrites all of her receipts on a small pad. And there is nothing that can stump her encyclopedic knowledge. But the store has one more secret – a garden out back. A tiny spot of green, overflowing with flowers – a quiet place to shuffle through your latest find. Submit yours, and encourage others to frequent these little gems. Thanks for stopping by. And if you're ever in town, you simply must check this bookstore out. It's a wonderful place. Great to hear! She is also sponsoring and Evening With David Sedaris at the Lucas Theatre on April 14, if you will be here then. She is a lovely person who absolutely loves (and knows!) books. I'll be in Savannah in a few weeks – definitely checking this out!